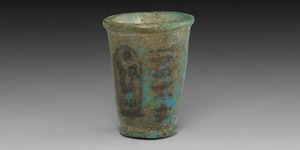 A blue glazed composition offering cup with flared rim and base, cartouche in black bearing the throne name of Seti I (Menmaatra), a vertical column of hieroglyphs to the side. 36 grams, 50mm (2"). Fine condition. Property of a UK gentleman; formerly in a private Belgian collection formed between 1960-1985.